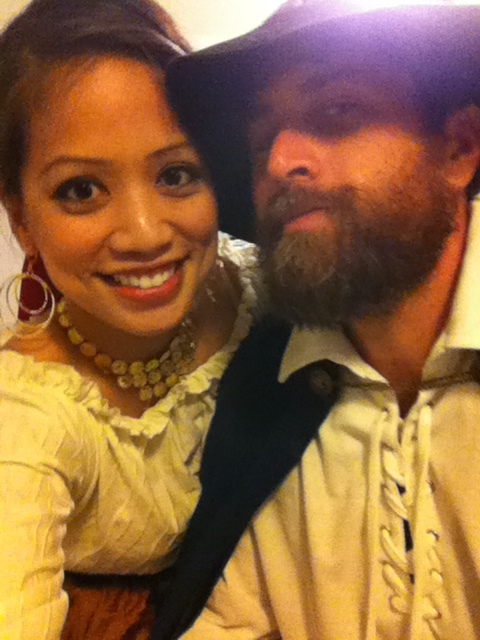 Trinh and I went to a costume party after the Spartan Race on Saturday. We were both crazy sore, but had a great time playing dress up. We are looking forward to taking our little man out on Halloween. He is dressing up as Robin, and it is super cute. What are your plans for Halloween? What great costumes do you have planned? Wearing the mask I was born with, and . . . not doing the Halloween thing. I really enjoy Halloween time. My son shares my enthusiasm for free candy, luckily. Oh, I like candies as well, but I would look kind of silly going around on my own . . . I would have to rent some children, thereby negating the whole “free” thing. Looks like fun. We like dress up, too. We have a black wizard, a kitty-princess and a golux so far. I usually love this time of year, but I will be moving into a new apartment. The next day doing a pub crawl for a friend’s 30th! Excited. She’s going as a make shift storm trooper with a tutu. You will have to take some pictures. A new apartment, are you excited? That’s a complicated question. I have big plans to make it a gamer paradise, but not having someone there is going to get lonely. Definitelty taking pictures when done! Sounds like fun. I like to decorate, but nowadays it is just fixing up my son’s train room. Funny how things change when you have a little one.